I’m pleased to say I haven’t had to buy bottled water for a while. There are so many reasons why I think we shouldn’t buy water in plastic bottles. For starters, it’s not good for us or the planet we live on and seem to be trying to ruin so effectively. We consume 50 billion bottles of water every year. 30 billion of those bottles are bought and consumed in the US which is insanely wasteful. It takes about three times the volume of water to manufacture one bottle of water, than it does to fill it. And there’s a huge amount of oil used in it’s production and transportation too. Although made with recyclable plastics, plastic bottles don’t biodegrade, they photo degrade. They break down into smaller fragments but that takes a really long time and it contaminates our soil and pollutes our waterways. Then there is the impact on the animals that digest those plastics. Some of which we then go on to eat. According to the Ocean Conservancy every square mile of the ocean has over 46,000 pieces of floating plastic in it. Think about that number for a moment. It’s depressing as hell and entirely preventable because plastic bottles and bags are the most prevalent form of pollution found on our beaches and in our oceans. If you’re not persuaded by the morality or the enlightened self-interest of looking after the only planet we have to live on, then think about the economics. Bottled water is really expensive and a wonderful way to waste money that I’d certainly rather spend on almost anything else.. So, how to get around buying bottled water? It’s easy, you just carry a refillable bottle instead, and top it up from the tap. Depending where you are of course, that can be a more or less risky proposition – you can’t always be sure the water is clean enough to drink. If you are uncertain of how clean your water source is, buy a water filter. There are many out there. Ultraviolet light pen purifiers, Pump-action, gravity fed, and squeeze – some of them are monsters designed for the great outdoors that you wouldn’t or couldn’t reasonably ask anyone to carry one around with them at all times. 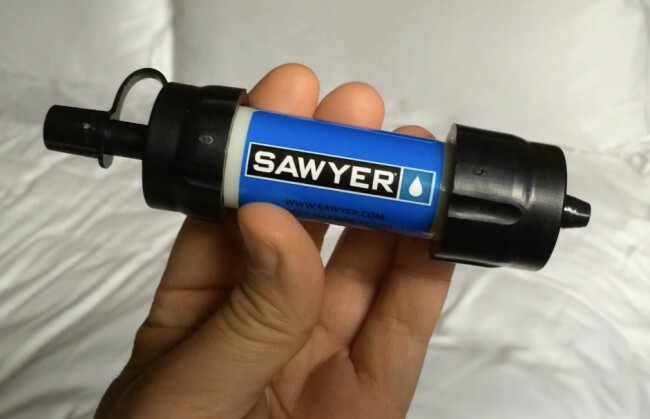 I first heard about Sawyer from a friend who has taken various water filters around the Middle East on his work travels, and who always ends up breaking them from repeated use or finding irritating niggles. The Sawyer filter was the first one he had no complaints at all about. So I wrote to them and asked if I could review one, and they kindly sent the Sawyer mini through. As with any filter, you’ve got to read the instructions before you use it. It’s extremely easy to use – I’d say idiot proof, really – but nonetheless must be used properly if you want it to filter out the bacteria that otherwise will make you sick. Also remember with this particular filter that is it not a purifier. That means it does remove bacteria – the likes of E.Coli, Salmonella and those causing Cholera and Typhoid – but it does not remove viruses, which are physically smaller and can therefore, slip through it’s 0.1 Micron rated filter membrane. To remove viruses with a filter you need something as small as 0.01 Micron, or you end up having to use a UV pen, chemical tablets or boiling to make sure the viruses are gone. That, of course, adds huge hassle but is something you have to think about if you’re in a place where the water might be contaminated by animals or humans. But, a filter – not purifier – is something I’m more than happy to use for domestic back country travel or suspect tap water. The beauty of the Sawyer Mini is that, while it is suited for the rigours of use by Bushcrafters and survivalists, it is also small, light, portable and easy to use for anyone who needs clean drinking water from mildly questionable water sources. You really can carry this filter around all day in your pocket. As I write this I’m sat in a hotel room in Bogatá, Colombia. 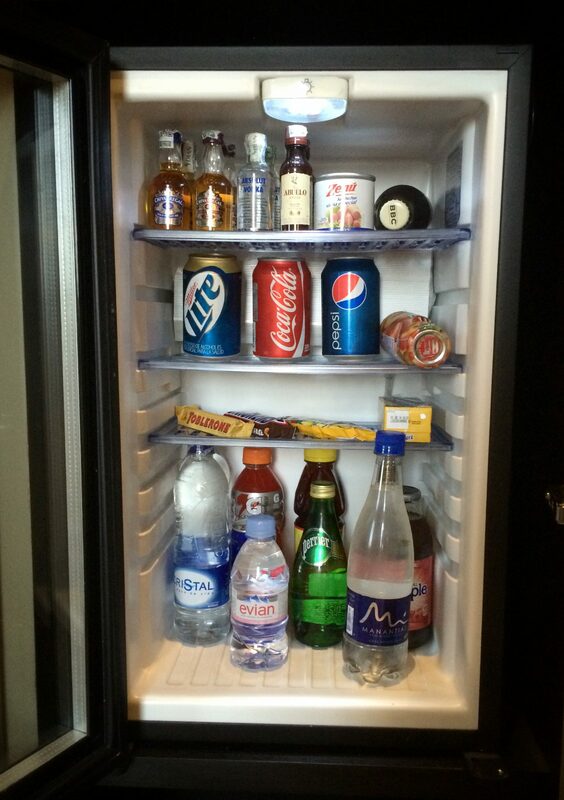 There are five different brands of bottled water in the room. And one tap. I’m told the water in the tap might be okay to drink but there’s no need for me to take any chances as it only takes a minute to filter my own. I nearly died once in India after drinking contaminated water. A messy, unpleasant experience I have no intention of ever repeating, especially if all I have to do is invest in a filter or purifier. I’ve seen the Sawyer Mini Filter sell for between $20-$35 in the States and around £29 in the UK. Make a note of all the bottled water you suddenly don’t need to buy. This filter pays for itself after you’ve filtered 14 litres of clean drinking water you’d normally pay for. And, if you keep it clean – which is also easy – there is no reason why you’d ever need to buy another filter in your life. This one just keeps on going. If you used it for your recommended daily intake of three litres of water it will last you 347 years. Or if you used it to provide clean drinking water for a family of four you would not need to replace it for 80 years. Most filters don’t have that kind of longevity, and often have expensive ceramic elements that need replacing pretty regularly because they wear out. Ceramic filters also need you to carefully take them apart and clean them by hand – they’re pretty fragile. The Sawyer mini is much easier. It comes with a large syringe they call a ‘cleaning plunger’. This is used to ‘backflush’ the filter dislodging and flushing any particulates that may clog the filter and shorten it’s life. It’s a four minute job, if you’re slow. The kit also comes with a straw attachment for drinking straight through the filter and there’s no need to pump as you do with some water filters. The included a ‘squeeze bag’ once attached and containing the water you wish to filter, is a breeze to use. This is useful if you’re on the move; you can fill the squeeze bag up at a tap and filter it into your own re-fillable bottle. The only negative I can see so far is that the filter gets killed if water freezes inside it. To be fair, that’s a problem for all filters that I know of. Freezing water particles expand and break them irreparably. So if you’re somewhere cold you have to keep the filter in a pocket close to your body, where it will stay above freezing. The Sawyer mini is more than small enough to do that – which you really cannot say about most other filters. All told, I’m impressed, would recommend it and am delighted not to be buying tap water, either here in Colombia or when I’m back in the UK. It’s well worth remembering the next time you look at an over priced bottle of water that may itself have come from a tap, or the next time you see plastic anything dumped by a roadside or on a beach. Read more info on how to treat water. Great article & thanks for the info. Is Sawyer filter really safe to use for everyday water drinking purpose, if i am not travelling (when compared to recent RO & chemical/boiling purifier filters available) ?